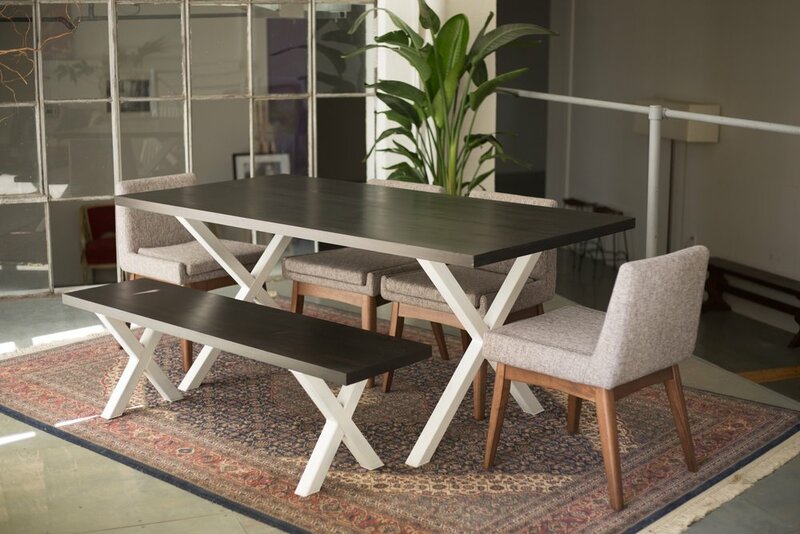 This dining table is our contemporary alternative to the traditional Harvest Dining table. 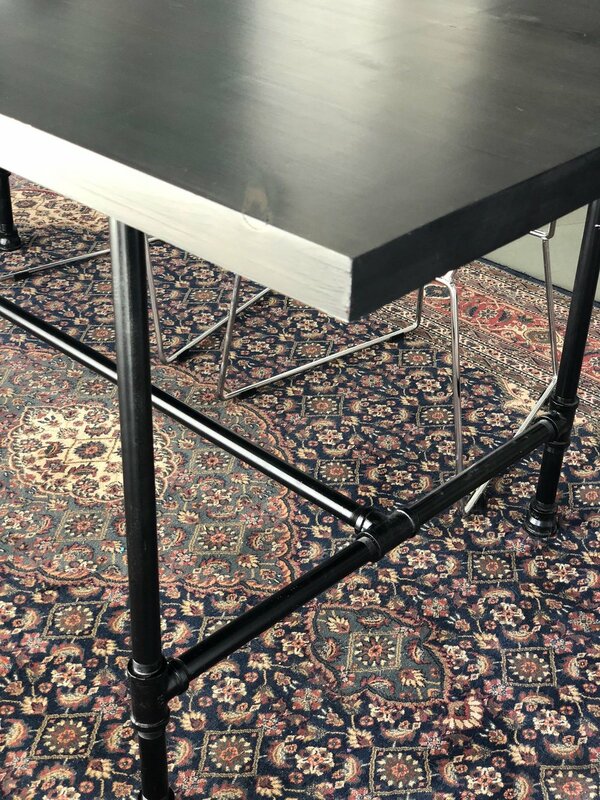 This table does not compromise on size nor the dining experience that comes with harvest tables, however its clean lines, warm tones and raw steel elements bring a refreshing and inviting feel to any home decor. Its solid wood tabletop available in knotty pine, walnut, maple (wormy or spalted) is supported by a sturdy raw steel x-base that has been welded together to ensure its longevity as families grow. Options for the base can remain in its natural colour or can be powder coated to a desired colour, such as the white base shown in the photo above. Stain options are also customizable from washed white to deep ebony. Shown to the right are washed white, early american and walnut. In the picture above, the ebony stain. For this dining table we drew inspiration from the traditional French worktable, which has an industrial aesthetic with its gas pipe base and weathered wood table top. 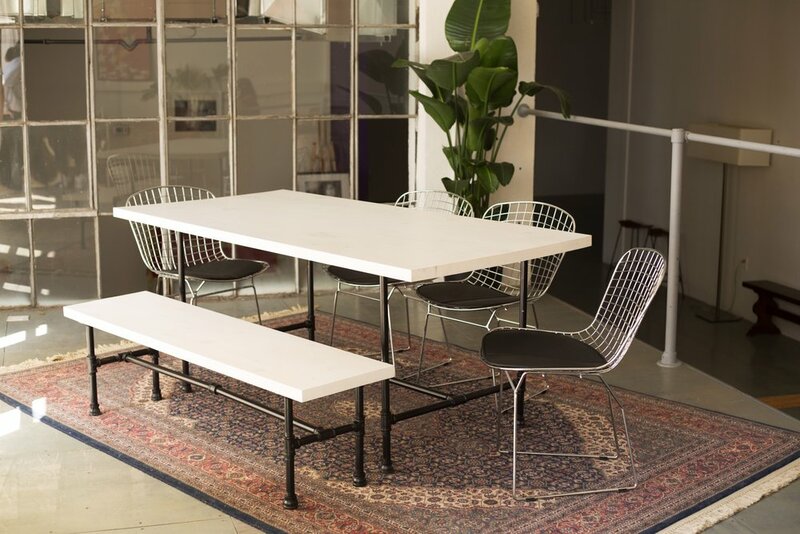 This style dining table and/or bench perfectly compliments spaces with raw elements, such as exposed brick, ducting and concrete or wooden floors. Its solid wood tabletop available in knotty pine, walnut, maple (wormy or spalted) is supported by a sturdy raw steel base to ensure its longevity as families grow. Options for the base can remain in its natural colour or can be powder coated to colour as desired, as shown in the photo above. Other custom options can include castors for added mobility. Stain options are also customizable from washed white to deep ebony. Shown to the right are ebony, early american and walnut. In the picture above, the washed white stain. This dining table is inspired from the Mid Century Modern era where the hairpin made its debut. Its lean design appeals to those seeking a minimalist aesthetic paired with the warmth of timber. 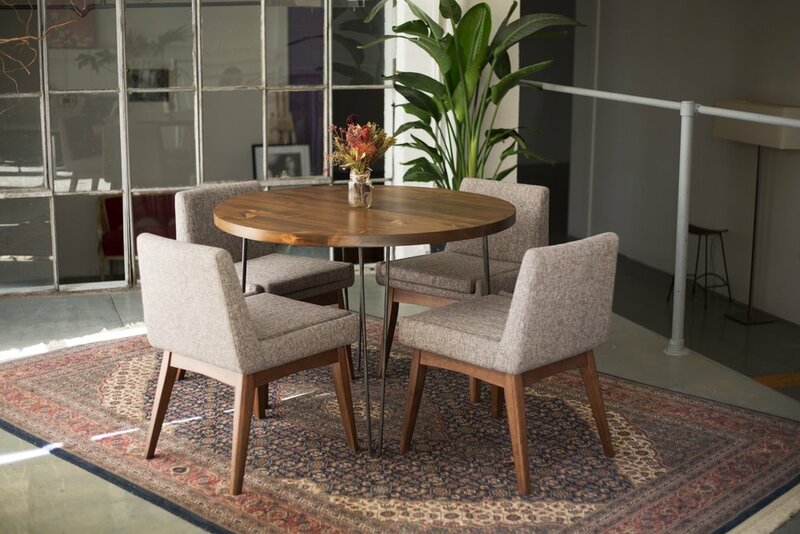 Featured in this photo is the round hairpin table, however square and rectangular table tops are also available. Ideal for smaller areas of the home, its clean lines, warm tones and raw steel elements bring a refreshing and inviting feel to any home decor. Its solid wood tabletop available in knotty pine, walnut, maple (wormy or spalted) is supported by sturdy raw steel hairpins that have been welded together to ensure its longevity as life happens. Options for the base can remain in its natural colour or can be powder coated to a desired colour. Stain options are also customizable from washed white to deep ebony. Shown to the right are washed grey, washed white, walnut and ebony. In the picture above, the early american stain.